See the forest for the trees. : favorites. i LOVE when parents say they don't have favorites, when it comes to their kids. i have one. i'm not going to lie. and maybe 'favorite' isn't the right word. that's kind of harsh. but maybe the 'easiest' child, we'll say. the one that gives you little grief, is your little angel. the 'golden child' as i call him, that lives for your approval, dotes on your every move & can do no wrong. and then there's your baby. well, they're just your baby. when you've finally BEGUN to SORT OF figure out parenting, you now know how CRAZY fast they grow so you want to hold on to this baby forever, even if they're not really a baby anymore. and yes, again, i have my golden child. not necessarily my 'favorite' person right now, but the most interesting, independent, strong-willed, sassy & beautiful one. i've spent the past few weeks, trying to 'stay on top' of the chaos that is her bedroom. this beautifully remodeled, shabby-chic, delicate 'little girl's' room has become a war zone over the past few weeks & i've FINALLY & intelligently decided to throw in the towel on keeping it clean & organized for her. 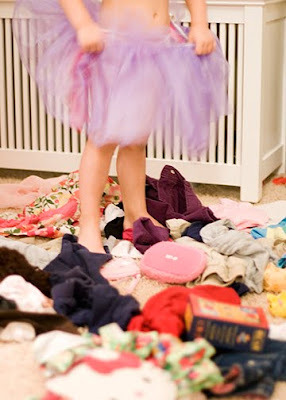 she prefers messy, chaos, sitting in a pile of clothes, toys & books & playing happily. i spent a good portion of my quiet time off (while she was at school the other day,) 'resetting' her room for the 50th time this week, all in an effort to 'take care of' my baby girl, make things nice for her, blah, blah, blah. when i opened the door this morning, i awoke to this. again. that's it, i thought. what am i doing? this is wasting SO much of my time & energy. i just need to let her 'be who she's going to be,' starting NOW! even if she's only 3.
yes, we teach her to pick up after herself & help out with small things around the house, which she does (usually) willingly, especilly if it means more praise for her. we teach her (& the boys,) what it means to have good manners, be respectful, kind & giving. but when it comes to her space, her own room, this is a battle i'm not going to fight. i feel like she's 16, that this is a challenge most parents face with their teenagers! but i'm just not going to let this stress me, now, or when she IS a teen. ?????? seriously? 3? God help me. but honestly, i find this kind of endearing about her. she is a girl. that's for sure. girls (women) are crazy. we are. we're wired in such a complex, crazy way, when compared to men. but to see her being her own little girl & to LET her be her own little girl, is very freeing, invigorating. 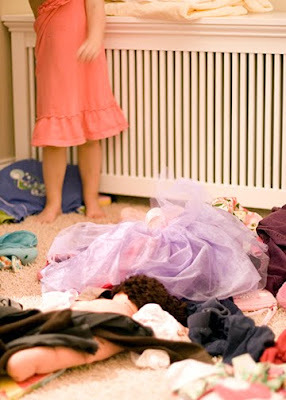 to LET her trash her room & 'live amongst chaos,' is her prerogative, yes, at 3.
and i should let her, because who really cares how beautifully organized & clean her room is? so, that was a nice 'aha' moment for me this week. stop fighting it. just let it go. 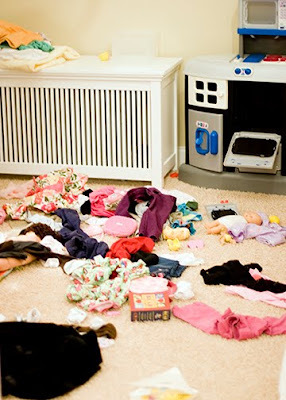 so, as a parent, i've accepted that i can't change her, make her who i WANT her to be, but simply love her, care for & nuture, discipline of course, but let her trash her room if she wants. AND LOVE that she chose the tutu instead of the sun dress to wear on this -40 degree minnesota day. hey, i didn't say she was fashion-savvy. but admire her style & courage anyway.